Are you new to language services, an experienced industry veteran, or an industry outsider who would like to learn more? Have you been waiting your whole life for somebody (anybody) to please publish a book about the language services industry that doesn’t bore you to tears? Are you a translator or owner of an LSP that is looking for insight into how to grow your business and make more money doing what you love? Has your manager just told you that you are now in charge of something called “localization” and you need to figure out what the hell they are talking about? Are you a manager that has just told your employee they are in charge of something called “localization” and would like to give them a book so you don’t have to pretend you know what the hell you are talking about? If you answered yes, no, or maybe to zero or more of the above questions, then this, my friend, is the book for you! 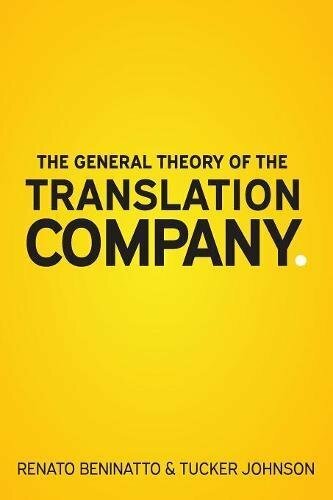 The General Theory of the Translation Company condenses decades of combined experience in an easily digestible and entertaining format. Just like this back-of-the-book-summary, it does not provide all the answers. It teaches us how to ask better questions and to have more meaningful conversations about language services. If you have any questions about this product by Nimdzi, contact us by completing and submitting the form below. If you are looking for a specif part number, please include it with your message.